Luisa Via Roma is a retailer of high end fashion clothing and accessories, based in Florence, Italy, with offices in the United States and throughout Europe. The privately held company has only two flasgship stores, both in Florence, but most of their sales are generated through the online store at luisaviaroma.com, where they ship globally. Products include Men, Women and Children's clothing, Jewelry & Accessories, and even Home Decor items. They stock only luxury brands and designer products, such as Jimmy Choo, Dolce & Gabbana, and Dior Homme. The company traces its roots back to 1930 when the first store was launched in Florence, which still remains there to this day. The online store was opened in 2001 and now serves 125 countries, with over 4 million customers a month. Unlike a lot of eCommerce sites Luisa Via Roma is an authorised retailer of all brands it stocks, meaning customers are guaranteed authenticity and high quality. Andrea Panconesi has served as CEO since the launch of the website. Armani Giorgio, Brioni, Calvin Klein, Dolce & Gabbana, Etro, Ferragamo Salvatore, Z Zegna, Vivienne Westwood, Saint Laurent, Marni, Jimmy Choo, Haider Ackermann, and hundreds of others. Clothing: Tees, Vests, Long Sleeved Tops, Rompers, Shorts, Skirts & Dresses, Jens & Trousers, Leggings, Jackets & Outerwear, Polos & Button Shirts, Blouses, Swimwear, Underwear, Socks, Lingerie. Accessories: Handbags & Other Bags, Jewellery & Watches, Wallets & Purses, Belts, Cuff Links, Hats, Sunglasses, Ties, Umbrellas, Phone Cases, Scarves, Stationery, Gloves, and more. Home: Bed & Bath, Furnishings & Wall Art, Table Top Accessories, Lighting, Ornaments, and more. There is also a separate sales page, so you are sure to find a bargain, and you can use the search bar to find a specific product by keyword. If you are looking to get somebody a gift but aren't sure what to buy, there's always the option to buy a gift card so they can make their own decision. These range in value from $100 to $5,000, and can be sent via email or as a physical card. 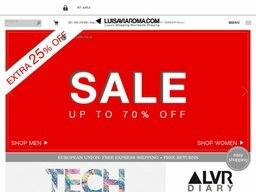 It's a good idea to save as much money as you can when buying from Luisaviaroma .A good way to do this is to check out Coupofy Coupons to see if there are any special offers on their updated list to suit your needs. A simple search of the site will provide you with a list of links that will take you right to Luisaviaroma .com where you'll be ready to save. You can also use a Paypal account to checkout and pay with. If you have one of their girt cards this can be redeemed for all of your order, or just a portion. The remaining balance must then be paid on credit card. Luisa Via Roma ship their products worldwide from the single website. All you have to do is click the country drop down box at the top of the page to choose your destination country, language and currency, which will then update the site accordingly. In the US shipping costs are factored in to the item's price, effectively making it free. Delivery can take up to 10 business days. Shipments worldwide are made with either UPS or DHL. Standard shipping can take a few weeks, whereas expedited shipping can take a couple of days, depending on the customs in your country. Returns for a refund or exchange are accepted within 28 days of the delivery date. Keep in mind the fact that the items must be in their original condition and that the tags must still be attached.